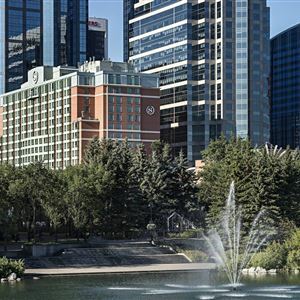 Property Location Sheraton Suites Calgary Eau Claire is in the heart of Calgary, walking distance from Calgary Chinese Cultural Centre and Prince's Island Park. This 4-star hotel is within close proximity of Knox United Church and McDougall Centre. 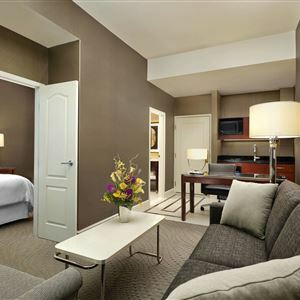 Rooms Make yourself at home in one of the 323 air-conditioned rooms featuring microwaves and flat-screen televisions. Wireless Internet access (surcharge) keeps you connected, and digital programming is available for your entertainment. Bathrooms have complimentary toiletries and hair dryers. Conveniences include phones, as well as safes and desks. Amenities Don't miss out on the many recreational opportunities, including an indoor pool, a waterslide, and a spa tub. Additional amenities at this hotel include complimentary wireless Internet access, concierge services, and ski storage. Dining Grab a bite to eat at the hotel's restaurant, which features a bar, or stay in and take advantage of 24-hour room service. Quench your thirst with your favorite drink at a bar/lounge. Cooked-to-order breakfasts are available daily from 7 AM to 11 AM for a fee. Business, Other Amenities Featured amenities include complimentary wired Internet access, a business center, and express check-in. Planning an event in Calgary? This hotel has 11840 square feet (1100 square meters) of space consisting of conference space and meeting rooms. Sheraton Suites Calgary Eau Claire is in the heart of Calgary, walking distance from Calgary Chinese Cultural Centre and Prince's Island Park. This 4-star hotel is within close proximity of Knox United Church and McDougall Centre. Make yourself at home in one of the 323 air-conditioned rooms featuring microwaves and flat-screen televisions. Wireless Internet access (surcharge) keeps you connected, and digital programming is available for your entertainment. Bathrooms have complimentary toiletries and hair dryers. Conveniences include phones, as well as safes and desks. Don't miss out on the many recreational opportunities, including an indoor pool, a waterslide, and a spa tub. Additional amenities at this hotel include complimentary wireless Internet access, concierge services, and ski storage. Grab a bite to eat at the hotel's restaurant, which features a bar, or stay in and take advantage of 24-hour room service. Quench your thirst with your favorite drink at a bar/lounge. Cooked-to-order breakfasts are available daily from 7 AM to 11 AM for a fee. Featured amenities include complimentary wired Internet access, a business center, and express check-in. Planning an event in Calgary? This hotel has 11840 square feet (1100 square meters) of space consisting of conference space and meeting rooms.